Sir Richard Arkwright, a hair stylist and barber was also an inventor of a device that quite transformed the means by which cloth fabric was converted from raw materials of cotton thread or wool yarn. In so doing he represents an early step toward a new level of integrated mechanization that required accompanying social changes to create an entirely unprecedented means of employment. 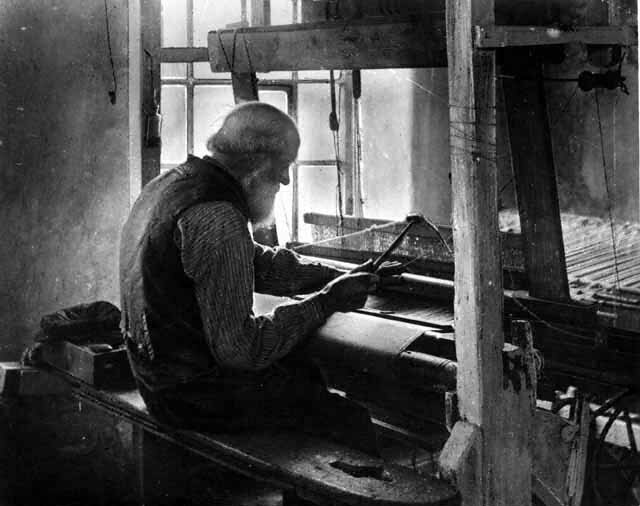 There are many who argue that changes associated with weaving and spinning, referred to as textile manufacturing formed one of the important foundations of the industrial revolution that occurred between 1700 and 1900. "One thinks of that other hairdresser. Richard Arkwright, whose eighteenth-century water frame was a key invention in the shift from hand to power spinning in the transformation of the textile industry." Pursell, White Heat, p. 45. Richard Arkwright, the hairdresser turned manufacturing entrepreneur and later knighted for his alteration of the textile industry in Derbyshire in the late 1760s. 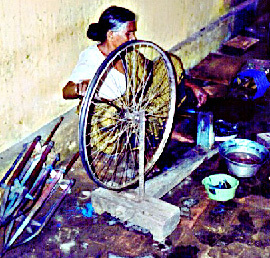 A woman spins cotton fiber into thread using a discarded bicycle wheel adapted to what was a very ancient process. 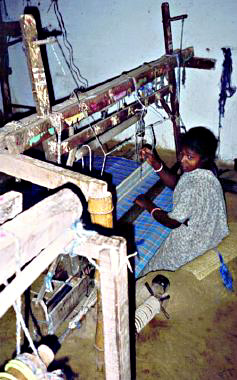 Before yarn or thread can be woven into fabric, the wool or cotton (silk also) must be transformed by spinning. The use of this bicycle wheel is also an example of exaptation. Arkwrights water frame, patented in 1769. required extensive adaptations of skilled, craft labor to these new complicated kinds of machinery with numerous moving parts. The water frame. Pursell, p. 104. Significance of the water frame? Richard Arkwright thus became accepted as the pioneer of cotton spinning in factories, not only because he had better machines, but also because he was more effective at tackling the problems of discipline and organization. "Arkwright created the first mechanization of production in 'a hostile environment without protectors, without government subsidy, but nourished by a relentless utilitarianism that feared no financial risk or danger." NEXT: The importance of power looms over hand looms. 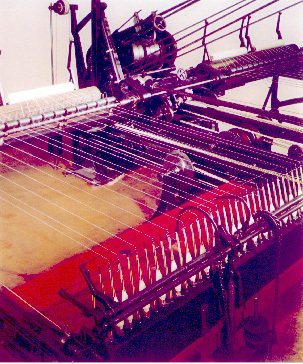 The move from hand looms to power looms and the social transformation of labor and technical production. In any case, toward the end of the eighteenth century, technocracy was well underway, especially after Richard Arkwright, a barber by trade, developed the factory system. In his cotton spinning mill, Arkwright trained workers, mostly children, "to conform to the regular celerity of the machine', and in doing so gave an enormous boost to growth of modern forms of technocratic capitalism." "The new royalty was reserved for men like Richard Arkwright, whose origins were low but whose intelligence and daring soared. Those possessed of such gifts could not be denied political power." "These are the men who created the twentieth century, and they achieved wealth and prestige, and power that would have amazed even Richard Arkwright." The Lowell Mills in Massachusetts [photographed below] applied water power to operate textile machinery employing women and children to operate these more 'self-acting' types of machinery that ran at high speeds and made a deafening sound when in motion. The extensive character of these buildings and the supporting structures needed to supply people, power, and raw materials to these factories transformed New England from 1798 on. 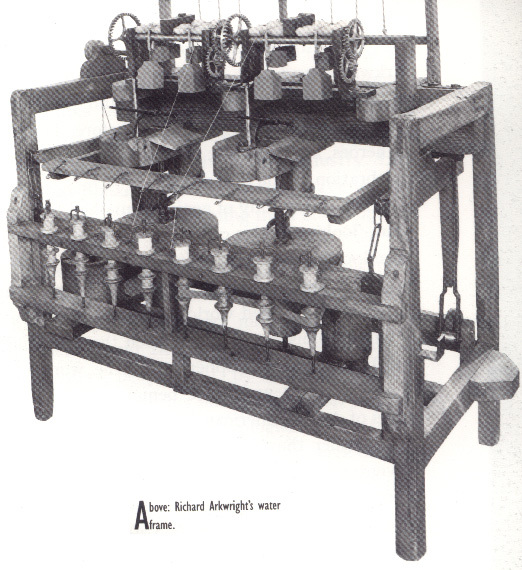 In the manufacture of calicoes, yarn spun on Arkwrights machines proved suitable. Arkwright had been lobbying the government and had persuaded it to reduce the excise duty payable on calicoes made in Britain." Some stories are more than just a good yarn. Some inventions are so critical we call them triggers. The accompanying social changes are as important as the introduction and spread of new inventions to the success of technological breakthroughs. See and investigate the Lowell Mills for yourself!